Brides and bridesmaids, the pressure of looking stunning and classic for every ceremony is real, and we know it. You want your outfit to standout yet don't want it to burn a hole in your pocket. Is that even possible? Thankfully for you, it is a reality at Nizkaya Studio, a gorgeous wedding boutique that has something for every kind of budget. Located opposite Sane Dairy, below Cosmos Bank in Bhandarkar Road, Nizkaya Studio is a one-stop-shop for a breathtaking wedding trousseau. From royal lehengas to elegant Banarasi sarees and chic Indo-Western gowns, the boutique has it all. We fell in love with their shaded chikankari sarees with resham multi-coloured borders. What stood out for us the most was its glorious collection of panelled gowns under INR 7,000 and spectacular designer sarees under INR 3,000. Besides, there are a ton of options: sequinned work, hand-stitched patterns, summer hues, soft pastels, luxurious fabrics, and more. The clothes at Nizkaya start at INR 1,999. 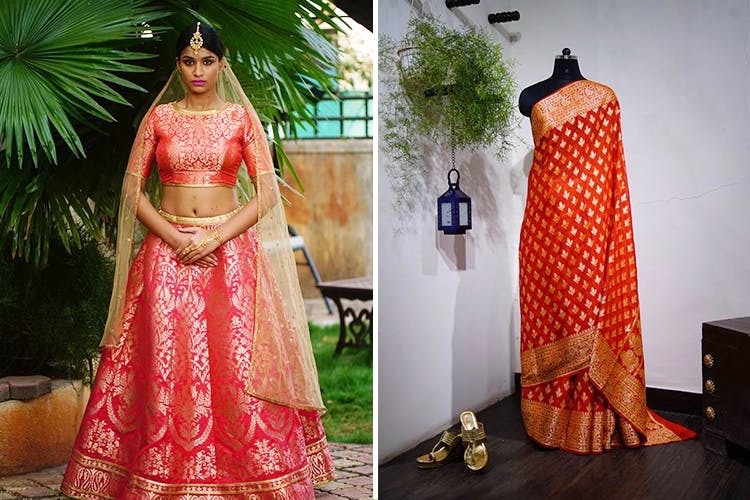 While the lehengas cost between INR 7,000 and INR 25,000, the Banarasi dress material can go as low as INR 2,700. Dupattas at Nizkaya start at INR 1,000 and can easily amp up your ethnic wear in a jiffy. The latest ones in their wedding kitty are the Rangoli sarees which are colourful and quirky, giving you a hatke look. Go, hurry up and check them out.